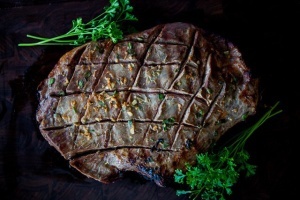 Marinades are a quick and easy way to turn your favorite flavors into healthy recipes. 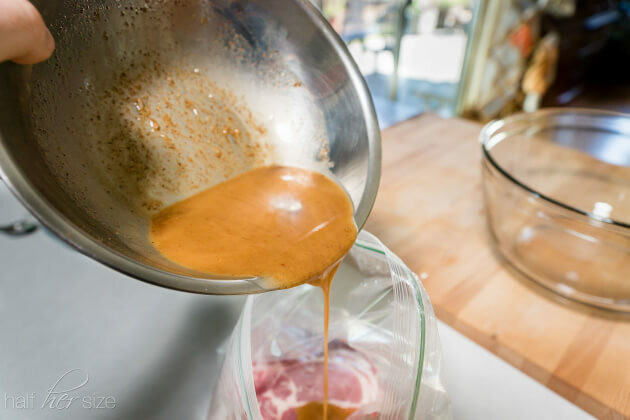 I often turn to my favorite marinades when I am brainstorming no-oven summer dinner ideas. Marinating leaves pork moist, juicy and extremely tender. This marinade pairs fresh lime with chili flavor to give your meat a kick while tempering the heat – it is sure to be a winner for lovers of big flavor. For a knock-out side dish, use this recipe and marinade to prepare grilled vegetables like bell peppers, onions, and summer squash. Summery lime juice and bold chili powder make the base for this easy marinade. 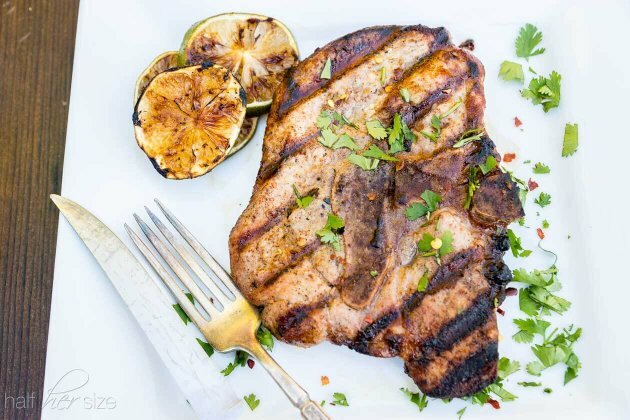 Marinading is the best way to create flavorful grilled pork that comes out tender and juicy. There is a soft spot in my heart for meals cooked on the grill. The sizzle of meat on a hot grate and whiffs of barbecue smoke in the air take me to the weekends of my childhood. Our 1920’s home was not designed for outdoor living. In the early 80’s my, young and ambitious, parents bought their first house and took on the enormous task of transforming it inside and out. Over a decade and a half they excavated, constructed, and landscaped until we had a complete outdoor refuge, with a lattice covered patio, perfect for outdoor entertaining. Dinner on the patio meant we all worked together. Dad took charge of the grill in the back of the house. Upstairs, in the kitchen, Mom blanched ears of corn, cut watermelon (with seeds) into wedges, and tossed vegetables into salad. It was up to my sister and I to trek between the two locations ferrying trays heaped with plates, homemade cloth napkins, silverware, glasses, and all other necessary condiments and accessories for the evening’s meal. We were not eager to hop to our duty, which involved many trips up and down multiple sets of stairs my dad and his brothers built and rebuilt during the years we lived in the house. Reflecting back I can wistfully say, schlepping the contents of our kitchen back and forth was character building, but, at the time, it was a royal pain. Outdoor meals were somehow different than those we shared in the kitchen. We chewed slower, breathed deeper, sat longer, and watched the world around our patio flow with the breeze. The conversation seemed lighter and we often stayed at the table until the golden sun dipped below the houses across the alley and the shadows stretched over us. 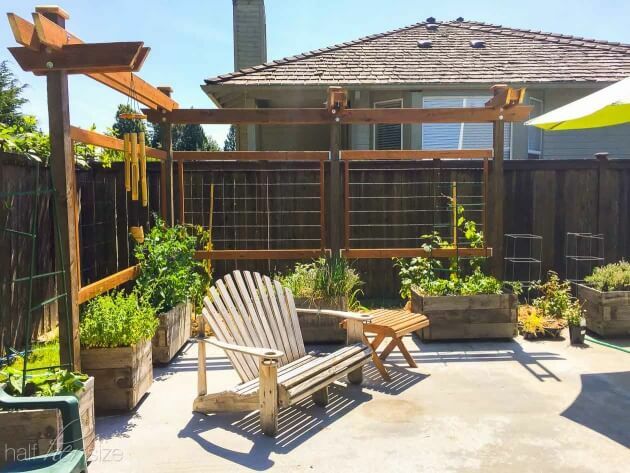 A few weeks ago my husband finished a project that turned the drab slab of concrete covering half of the backyard into our very own outdoor oasis. It is a treat to sit around our patio table listening to birds chirp, watching bees flitting between the blackberry blossoms and vegetable garden, and catching the occasional glimpse of a hummingbird zipping up to the feeder hanging by the back door. We step right out of the kitchen on to the patio. I can easily prepare all the components of a meal while tending the grill. However, dinner on the patio is still a group effort with my husband gathering the dishes, beverages, and condiments. The boys are starting to help set the table and I look forward to the summers ahead when they can completely take over the task – to build their character. I am as sure now as I was then, dinners on the patio are different. The kids still get up to their usual mealtime antics but somehow, my husband and I are able to chew slower, breathe deeper, sit longer, and watch the world flow with the breeze until the light turns golden and the shadows stretch over us. Place the pork chops in a gallon size zip top bag. In a medium bowl, whisk together the marinade ingredients from the oil-allspice. Add the marinade to the pork chops, then press out as much air as possible as you seal the bag. Place the bag on a plate and refrigerate, on the lowest shelf, for a minimum of 1 hour (four hours is best), turn the bag once or twice if possible. Remove from the refrigerator 30 minutes before placing on the grill. 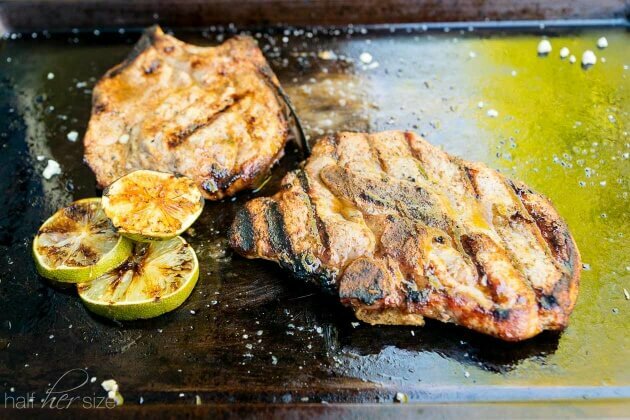 Grill the pork chops for about 4-6 minutes on each side, time will depend on grill temperature and the thickness of your chops. When finished they should be slightly springy when poked and reach an internal temperature of 150F. Remove from the grill and allow to rest 10 minutes before serving. 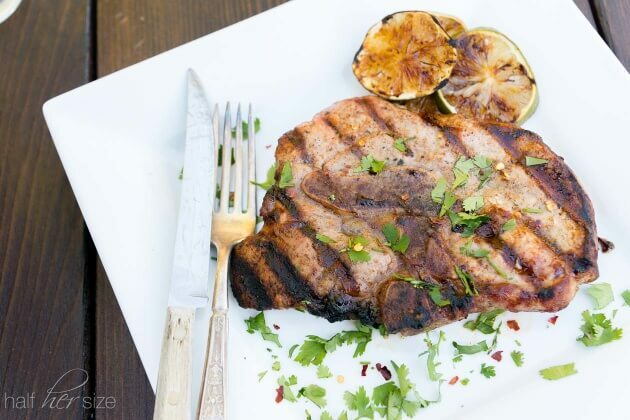 What goes great with grilled pork chops? 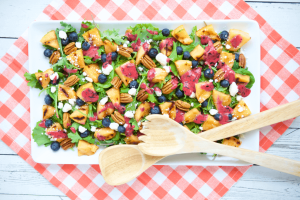 A grilled cantaloupe salad!